Here’s a way of eating that makes sense—and saves dollars. 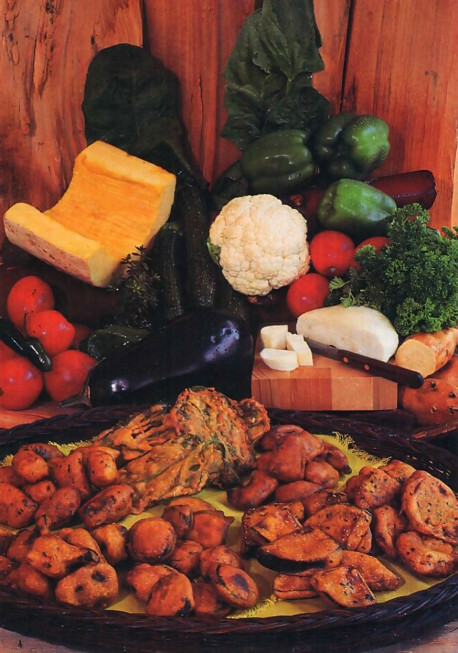 Adapted from The Higher Taste, a guide to vegetarian gourmet cooking, based on the teachings of His Divine Grace A.C. Bhaktivedanta Swami Prabhupada and published by the Bhaktivedanta Book Trust. 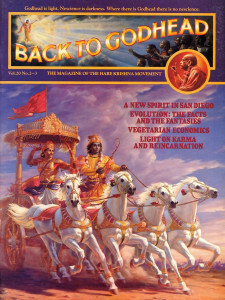 The principal reason members of the International Society for Krishna Consciousness are vegetarian is that they eat only food that has been offered to Lord Krsna, and Krsna won’t accept offerings of nonvegetarian food. The devotee offers food to Lord Krsna as an expression of love for Him, and by eating the remnants of those offerings the devotee enjoys a transcendental reciprocation with the Lord. That is the perfection and the highest benefit of vegetarianism. By God’s arrangement, however, a vegetarian benefits in many other ways as well. Economically, for instance. According to the U.S. Department of Agriculture, the U.S. feeds more than ninety percent of its grain to livestock—cows, pigs, lambs, and chickens. This practice, however—using grain to produce meat—is incredibly wasteful. As the USDA’s Economic Research Service showed, we get one pound of beef for every sixteen pounds of grain. In his book Proteins: Their Chemistry and Politics, Dr. Aaron Altshul notes that in terms of calorie units per acre, a diet of grains, vegetables, and beans will support twenty times more people than a diet of meat. At present, about half the harvested acreage in America goes to feed animals. Were we to utilize the earth’s arable land primarily for producing vegetarian foods, the planet could easily support a population of twenty billion or more. Now, getting down to our own pocket-books, many vegetarian foods are dollar for dollar a better source of protein than meat is. A typical hundred-gram portion of meat contains about twenty grams of protein, whereas an equal amount of cheese or lentils yields about twenty-five grams. And one hundred grams of soybeans yields thirty-four grams of protein. Now, compare the costs. Sirloin steak runs at least $3-$4 a pound, whereas many vegetarian protein foods can be had for a small fraction of that amount. Becoming a vegetarian could save an individual shopper hundreds of dollars each year, and the total annual savings to America’s consumers would be in the billions. Considering all this, it’s hard to see how anyone could afford not to become a vegetarian. The recipes we’re featuring this month are for pakoras—deep-fried, batter-dipped vegetables that are perfect as snacks, as hors d’oeuvres, or as part of a full-course meal. For frying, you can use your favorite nut or vegetable oil, but since pakoras taste best when cooked in ghee (clarified butter), we’ve included a ghee recipe. Offer these delicious savories to Krsna while they’re still hot, along with a sour-cream dip or spicy tomato chutney. Then enjoy the results of your offering: the satisfaction of pleasing Krsna, and the taste of the food He Himself has tasted. You’ll reap not only the nutritional and economic benefits of being vegetarian, but also an incalculable spiritual benefit. a large, heavy saucepan. Heat over a medium-high flame, stirring occasionally, until the butter melts and comes to a boil. 2. When the surface of the butter is covered with a frothy white foam, reduce the flame to very low. Simmer, uncovered and undisturbed, until a thin layer of crusty solids have formed on the surface and the gelatinous protein solids have collected on the bottom of the pan. The cooking time will be about three hours. The ideal finished ghee is of a transparent light amber color. Ghee becomes dark when cooked too long. 4. Be sure to cool ghee to room temperature before covering. Store in an airtight container in a cool, dark place, or refrigerate. Ghee that has been properly cooked, filtered, and stored will last for months. 1. Mix all the batter ingredients with water to make a medium-thick batter. Beat until smooth. 2. 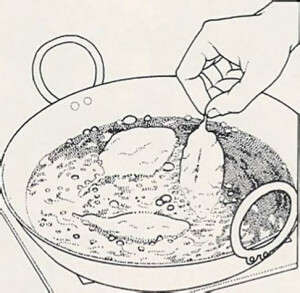 Heat ghee or oil in a wok or frying pan to about 350°F. Dip the vegetable pieces, one at a time, into the batter until they are evenly coated, then place them in the hot ghee or oil. Fry 5 or 6 pieces at a time, stirring occasionally, for about 5 minutes, or until they are crisp and golden brown. 3. Remove with slotted spoon and drain. Offer to Krsna immediately or keep warm, uncovered, in a 250 °F oven for up to one hour. Mix batter and let sit for 30 minutes. Peel the cooled, steamed bananas and slice into 1/3-inch pieces. 1. In a skillet heat ghee, then add mustard seeds, chili, and ginger and cook until mustard seeds finish popping. 2. Add tomato pieces. Cover and cook on medium heat for 15 minutes, or until the tomatoes become a chunky sauce. 3. Remove from flame and put sauce in a blender on low speed for five seconds. 4. Return sauce to skillet and add salt, sugar, and coriander powder. Cook for 3 minutes uncovered. Offer to Krsna hot or cold.